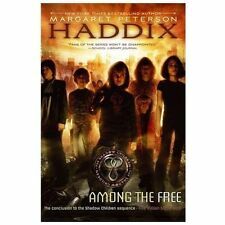 Among the Enemy by Margaret Peterson Haddix 9780689857966 (Hardback, 2005). Margaret Peterson Haddix. Author:Margaret Peterson Haddix. Shadow Children Books, Shadow Children. In a society that allows families to have only two children, third child Matthias joins the Population Police to infiltrate their system. An ache grew in his throat and he wanted to sob, but he set his jaw and held it in. He'd been wrong to send Nina away, wrong to refuse to help her, wrong to let the commander treat him like a pet. He'd been wrong to think that everything ended when he lost Percy and Alia....I can stop this evil, he thought. The Population Police are gaining more and more power, and illegal third-borns are in increasing danger. Young Matthias finds himself caught in the cross fire between the Population Police and the rebels -- and unwittingly ends up saving the life of a Population Police officer. By way of reward, the officer takes Matthias to the luxury of Population Police headquarters to train him to become one of their own. There, among his most feared enemies, Matthias encounters Nina, another illegal third-born, who enlists his help in a plot to undermine the Population Police. But Matthias is under constant scrutiny, he has no idea whom he can trust, and he's mourning the loss of his friends Percy and Alia. What can one boy do against a wicked bureaucracy? In the most exciting Shadow Children book yet, Margaret Peterson Haddix examines how the courage of individuals can make an impact on growing evil. "[The] brisk, efficient pacing facilitated by occasionally abrupt plot turns is precisely what has cemented Haddix's strong following among both avid and reluctant raders. Series fans and newcomers alike will devour this whole." My kids love this series!